According to Stats Canada (Table 004-0203 - Census of Agriculture, land use, every 5 years), Saskatchewan lost 2,068,246 acres of “natural land for pasture” in the province between 1991 and 2016. This means that more than 2 million acres of native grassland, aspen parkland and other forms of natural pasture land in the province were plowed under in the last 25 years. How much is 2 million acres? It is nearly ten times the size of Grasslands National Park, one of our last remaining protected grassland areas of any size in the province. That 2 million acres amounts to one-sixth of the prairie area in Canada being destroyed in a single generation. At that rate Saskatchewan is losing 80,000 acres on average every year, or more than 200 acres a day, or 9 acres every hour. Oh, almost forgot: It is Native Prairie Appreciation Week next week, so get out there and appreciate what we have left of our native prairie. 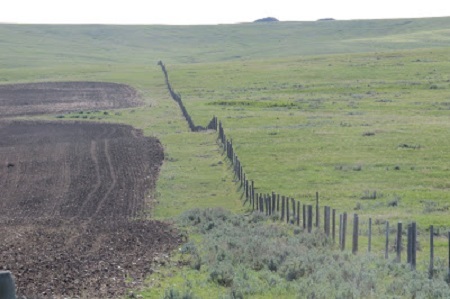 Photo: freshly broken prairie in Southwest Saskatchewan, where I often hear that no-one breaks native grassland anymore,” says Trevor Herriott. Source: Trevor Herriott’s Grass Notes.